I finally have a hearing date, and am so excited to (hopefully) be done with this long process. I started applying for social security disability over a year ago. I have had to appeal twice, and finally had to request a hearing. There have been many times over the past year when I considered just giving up. Unfortunately, so many people with chronic illness have to go through this process here in the United States. You would think over 3,000 pages of medical records for a 31-year-old is enough proof that something is wrong. Or that letters from friends, family, and doctors might be enough. Or maybe the number of conditions I have to deal with. But no, it's never enough. I have had journals over the years, but never really got into the habit of writing in them on a regular basis. For me, one of the most therapeutic things when I am feeling down is to write. It helps me to process whats going on, and to get out those feelings of sadness, anger, frustration. Sometimes this writing has even taken form in emails sent at 1am to people who may not understand, but can be there for you, no matter what. But, I found one I like, and it's an app! It's called the Five Minute Journal. It's also available in a paper version, but I like how convenient it is to have it on my phone. Every day when I get up, and every day when I get in bed I try to write in it. The last month has had a lot of ups and downs for me. I got to see a lot of people that I care about, but also was very challenged by my health. I got to see one of my best friends when he was in Boston for a few days! We were able to go out for lunch and catch up. We don't get to see each other often, so it was a nice surprise that we were in Boston on the same day! I went to Martha's Vineyard for week with a few friends. I had a lot of fun, and spent a lot of time relaxing on the beach. It's always my favorite week of the year. Huck was injured during a grooming appointment, which was very sad. He was limping for a few days, and we had to give him pain medicine (prescribed by his veterinarian, of course). He is still recovering, and isn't back to his usual bouncy self just yet. I have found it harder and harder to keep in touch with friends lately. I feel like it should be the opposite, with these smartphones in our hands 24/7, but I just feel more isolated. A big part of the problem it is that I live at least an hour away from most of my friends, if not more. There's not a lot of friends that I can call last minute to say "Hey, want to do something?". Any activity takes more planning, more effort on both sides. I often hesitate to plan something too far in advance because I'm worried I might have to cancel if I don't feel up to it. I tend to plan more group events where I have the control, like yearly trips to Martha's Vineyard (which is so so soon! ), where I usually have my own car, and it tends to be a slower paced weekend. I won't inconvenience anyone when I need to take a break. The last month has been a little crazy, some good, some not so good. On the good side, I surprised my brother for his birthday with a trip to Nashville! I coordinated with his girlfriend, and walked into the restaurant they were eating dinner at the night before his birthday. I think he was surprised, and we had a fun weekend together. I hadn't seen him since November. My room has been painted and cleaned! Or maybe the other way around, cleaned and then painted. I am not a neat, organized person when it comes to clothes. I have too many, and probably half of my clothes are either too big, or too small from all these weight fluctuations. I gave away two big garbage bags of clothes to my neighbors (3 girls ranging from 14-25, and their mom). I'm still working on decorating, but I love the color! Warmer weather, which is hopefully on it's way to the northeast. I can't wait to wear dresses without leggings, and sandals! Martha's Vineyard vacation this summer with friends, as always. One of my favorite weekends of the year! This year, we are going for a week! Half hour long phone calls with a certain friend that never fail to cheer me up. Volunteering for an organization that I've been super involved with in the past, but have taken a few years off. I'm getting back into it this year by volunteering at the 3 day conference! I am a little worried that it will be too physically taxing, but I want to try. Dating? Maybe? I'm out there on all the dating apps apps, and tried a month of Match.com...I haven't had much luck but we'll see what happens. Cushing's Awareness Challenge - DAY 30! Today is the last day of this Cushing's Awareness Challenge. I want to reflect back on the month, finish up any stories I didn't finish yet (I know there's at least one), and share a few of the favorite posts from the month in case you didn't see them. First - in unfinished business - I still haven't had the correct PET scan, or heard back from the doctor who ordered it. I have a scheduled appointment with him in June, but would rather not wait that long. I saw my new primary care team this past week! I am so happy with the new situation, and hope that this team will be taking some of the workload off my plate, just by being in the same system as my specialists. I am usually the one coordinating care, making sure everyone is staying updated, correcting lab orders, because my health is literally in my own hands, but having an actual M.D. helping should make things a little easier on everyone. My appeal for social security disability was denied. I feel so defeated. But, will fight on, because what other choice do I have? Many people with Cushing's, adrenal insufficiency, lupus, and other chronic illnesses cannot work due to their disability. It is not easy to apply for disability. There is a lot of paperwork involved, which can be hard emotionally to write about how much your illness limits you. You have to talk to all of your doctors, and get their support. Sometimes, even they will not understand the full picture. My mom has said a few times in the past week, if people like me can't get approved, who is it meant for? I think people have a hard time believing someone as young, and as healthy LOOKING as me, could have such disabling illnesses. I have tried my hardest to continue to work. If it were up to me, I probably would still be working part time, and being hospitalized routinely because of it. It is hard to be a good friend when you are sick. Illness is all consuming. Not many people my age really understand that. At 30-something, most are consumed with careers, finding who you want to spend your life with, having kids, even buying homes. Illness is a foreign subject. No one knows what to say when I bring up anything health related. The room gets quiet. On the other hand, illness is my whole life. I don't know anything about having a real career, having a boyfriend, buying anything major, let alone a home. And kids are not even on my radar yet. My life is filled with medications, appointments, side effects, disability applications, lab tests, and trying to keep on top of all of that, because I can't count on anyone else to. I live a lonely life. Not on purpose, but almost by default. Sure, I have friends. I even sometimes talk to, or see these friends. But we often can't relate to each other's worlds. The Pituitary Network Association is one of my favorite resources for getting information about pituitary related things. They have published a Patient's Bill of Rights that I have referred back to hundreds of times. I used to have it hanging at my desk at work. I have posted it on this blog before, but will post it again today, just because I think it is so important. I especially love the second to last one. Did you know that dogs and horses get Cushing's too? Horses and dogs have similar symptoms to humans, like muscle weakness in their legs, and central obesity. Horses' hair gets curly too! That is a newly recognized symptom of Cushing's in humans. When I told people about Cushing's, one of the common responses was "My friend's dog had Cushing's!" Veterinarians know a lot about Cushing's, often even more than a regular endocrinologist! What do you think of when you imagine someone who is disabled? Do you picture someone in a wheelchair? Or someone who uses another mobility aid? I'm guessing, if you are reading this blog, that might not be the first image that comes to mind. So many people around the word have invisible illnesses, many of those illnesses can be disabling. For me, it is not one illness alone that can be disabling. It is the combination of many, and maybe even medication side effects also. But, no one would know from the outside that anything is wrong with me. My doctors know, they are the ones who suggested I might benefit from a handicap placard, not to be used always, but on the days where I have the most fatigue, trouble breathing, or joint stiffness. My friends and family are aware of my invisible illnesses, they are the ones who pick up on the blue tinge to my finger tips and lips when I am walking, and suggest slowing down, or even sitting to take a break. Being a caretaker is hard work. Especially when you are taking care of someone with a chronic illness. I have experienced being on both ends, as the person being taken care of, and the caretaker. My mom is my main caretaker. She is the one who sometimes comes with me to appointments, or will be the one in charge when I get very sick. She is also my health care proxy, so she makes decisions about my health when I am not able to. I help take care of my grandmother. Since I can not work, I have the most time to drive her to the post office, or to the bank. I also take her to appointments, or just sit with her at her home. She is still able to do some things by herself, but at 91 years old, she needs more and more help with simple tasks. To be a caretaker, you need to take care of yourself FIRST. You can't help someone else if you are not helping yourself. Steroids are my BFFs, but at the same time, they are the enemy. When I had Cushing's, steroids, whether produced from your body or taken in pill form, were the absolute worst. Now, my life depends on them. It's a hard switch to flip, and years later, still finding myself battling the need to hate them. I hate taking medication daily. I hate bringing pill bottles, needles, and vials filled with steroids everywhere I go. I often have pity parties, or bribe myself with a treat in order to get those medications down every day. It seems like, instead of getting easier and more routine over time, it has been getting more and more difficult. I am always terrified of taking too much and gaining weight. I am not as scared of taking too little and ending up very sick. It seems so backwards, but I think that is the leftover mindset from Cushing's. Do you take medicine every day? How do you stay positive about it? I always struggle with what to say, or how much to say, about my chronic illnesses. Someone might make a comment like, "You look so tan! Have you been on vacation?" and I am not tan from the sun, I am tan because of my rising ACTH levels, or maybe because I am jaundiced. I sometimes have given the full, real answer to people I encounter in a hospital setting, like lab techs, or nurses, but what do I say to everyone else? I have the same trouble when people ask how I'm doing. I have a hard time being honest and saying I feel horrible, all the time. My canned answer is always "I'm OK". How much do you tell people? And really, how much do they want to know? Are they looking for the full story, or just asking out of politeness? How do you face these challenges? How much do you disclose? Many people with Cushing's do not have a supportive primary care physician. They either don't believe their symptoms, or won't refer them to a specialist. I was fortunate enough to never have a problem with mine. Although she didn't know much about Cushing's, she was willing to refer me to multiple endocrinologists. I have been going to the same practice since I was born, and now, due to insurance issues, I will have to switch. Thankfully, my new PCP will be at MGH, where I receive the rest of my care. I am a little nervous to "start over" with someone else, but am sure that it will be more convenient for everything to be in the same place. Although, I am not looking forward to having to drive 45 min -1 hour if I have a sore throat and need a throat culture. I hope I can be as involved with my care as I have been, I love to participate in the diagnostic process, and sometimes even make the diagnosis myself (like with Cushing's). Do you ever come across someone you think might have Cushing's? I feel like I can pick people out of a crowd that have Cushing's, it's all about the body type (central obesity with thin arms and legs). I feel like I see people all the time that might have Cushing's. But how do you address it without offending anyone? I am a little shy, so I am not the kind of person to go up to a stranger and start a conversation. Especially about their personal health. My mom has given business cards with Cushing's information on them to people we think have Cushing's, but I have never been brave enough to walk up to a stranger and tell them they might have a horrible disease. Although, I wish someone did that to me looking back, but at the time I probably would have been a little offended. Would you consider going up to a stranger to tell them about Cushing's? What should you do if you think you have Cushing's? 1. Click the 3 lines you see in the upper right corner, scroll down about halfway, and take a look at some of those helpful websites. Those sites are what got me to the right endocrinologist, and helped me through the testing phase. 2. Make an appointment with one of the endocrinologists you find on those sites. 3. Make a list of symptoms to bring with you to your appointment. I also brought tons of photos, that showed me before Cushing's, so your doctor can see the progression. 4. Test like it's your full time job. Midnight salivary cortisol tests every night, 24 hr urine free cortisol tests a few times a week, take as many lab orders and supplies as your endocrinologist will give you. 5. Repeat until you get a diagnosis. You may have to repeat this process with multiple endocrinologists. Today is known as Marathon Monday here in Massachusetts. A few of my friends are running the Boston Marathon today! I can't even imagine the level of fitness it takes to be able to run 26.2 miles. I know for sure it will never be something I will attempt to do! I've talked about fitness in the past, and how I really never recovered (or gained, for that matter) any muscle tone after Cushing's. One of the symptoms is muscle weakness, especially in your extremities. I noticed this most when walking to class, which was uphill, or walking up and down stairs. I have wanted to get more in shape, not really for looks but more for my general health, maybe it would be easier for me to do things. I don't really enjoy physical activity, and never have. I was always the slowest person when we had to run a mile in gym class, and never really felt athletic. I have always liked to swim, but pools are hard to come by, and usually cost a lot to join. I spend a lot of my time with family. Whether it's my mom, who I spend most of my free time with, or extended family, I typically enjoy spending time with family. Today, about 30 members of that extended family are going to be getting together for Easter. I do not celebrate Easter in the religious sense (although, typically it is a very religious holiday). I have a hard time with faith. My grandmother is a devout catholic, she even spent time in a convent as a teenager. My mom was brought up in the Catholic Church, and I attended church regularly as a child. I always had a hard time matching my love for science and faith, it seemed to me like the two things didn't really mesh well. I stopped going to church when I was a teenager, and now don't go at all. Cushing's is a beast. I often say, I wouldn't wish it on my worst enemy. But, there are some things I would never trade, not even for perfect health. 1. My Cushie Community - I belong to a lot of Facebook groups, some that are just for people who have had BLAs, some for anyone with Cushing's. And I also have a few Cushing's friends that I see in person occasionally. I don't know what I would do without them, healthy or not. 2. The knowledge - before Cushing's made me very sick, I wanted to be a physician. Always had, even when I was seven years old. I have learned so much more about the human body, what it is really like to be a patient, and what it takes to be a good doctor, than I ever would have in a classroom. I have joked, I am basically an endocrinologist, now I have to go backwards and learn the basics. Hospital gowns, as I have said many, many times, are not fun to wear. They can leave you exposed, they are typically too big, and are generally uncomfortable. When I am staying in the hospital, I usually change into my own clothes as soon as possible. I am still waiting for someone to re-design hospital gowns! In the meantime, I am going to share what I usually pack, or have my family members bring to the hospital for me to wear. I've already told you about footwear, and usually bring flip flops, no matter what the season. They are easy to slip on and off, and can be easily washed when you get home. My favorites are the these. 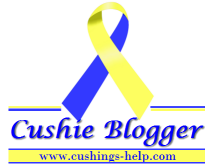 Did you know other people are blogging for Cushing's Awareness this month? This blogger needs your help! Melissa has one of the most viewed Cushing's Blogs! She is looking for your before and after photos to include in a video presentation about Cushing's. Go help her out! I take medication every single day to stay alive. At 24 years old, it was one of my main complaints after my BLA. Of course, I had taken medicine before that, even taken medication every day before that, but my life didn't depend on it. I remember one of my first outings after my BLA, with my mom, sister, and brother. We went apple picking. I rarely carried a bag or purse at this time. I had a toddler style meltdown when I realized I had to carry my bag with me. It was less about the bag, more about this new consequence of the surgery that saved my life. Today's post is a little bit out of my comfort zone. We're going to talk about weight. One of the most common symptoms of Cushing's is weight gain. Some people only gain 30 pounds, some gain hundreds. I always have a hard time quantifying the exact amount I gained because I was a teenager, or even a young child when I first had Cushing's symptoms. My best guess is about 150 pounds, only because that is close to what I've lost after treatment. When you weigh almost 300 pounds, people treat you differently. I know this, because I've also seen how people treat me now. There are a lot of expectations when you are finally treated or cured from Cushing's. It can be harder than having Cushing's, or it might be a breeze. Here's what I experienced after my BLA. At first, I didn't feel well, slept a lot, and lost a little weight. I experienced some heart problems within a few weeks of my BLA, and had to go back to the hospital twice. This was pretty scary, but luckily it ended up being nothing serious. I expected an overnight change, but I didn't really see or feel a positive change for about a year. I even got a few comments from people saying "I'm so sorry the surgery didn't work!" This was heartbreaking for me. I really wanted to prove, more to myself, but definitely to my friends and family, that I wasn't crazy. I felt that weight loss would finally prove that I was telling the truth, that I was sick. Medications to treat Cushing's is a newly expanding option. When I was diagnosed with Cushing's, only about 7 years ago, these new medications were barely in trial phases. I only tried a couple medications when I had Cushing's. I tried to get into a clinical trial of mifepristone but was denied because my blood glucose was not high enough. I didn't have many options outside of surgery or radiation. These days, the medication options are endless. Patients can be on medications from the moment they are diagnosed. For patients with a failed first surgery, this is a great option to get some relief from symptoms before opting for another surgery. The only potentially permanent treatment for Cushing's is surgery. Whether you have a pituitary tumor, adrenal tumor, or ectopic source of ACTH, most often, you will eventually need surgery. For me, the first step was a pituitary surgery to try to remove the tumor in my pituitary gland. They went through my nose to access the pituitary gland, which means you have no visible scars after. I was very nervous heading into the surgery, but didn't have much time to dwell on it, as my surgery was scheduled about a week after my IPSS. I talked to a lot of people before, about their experiences, and heard vastly different stories from each person. Today is Harvey Cushing's Birthday - which means today is Cushing's Awareness Day! Harvey Cushing is one of the fathers of modern neurosurgery. He studied brain tumors extensively. You can read more about him here. So, let's talk more about Cushing's. Over the next few days, I will be writing about the different elements of Cushing's, like medications, surgeries, diagnosis, testing, and what to expect once you are treated. Today, we are going to talk about diagnosis and testing. For most patients, testing will include midnight salivary cortisol, 24 hour urine free cortisol, MRI, and for patients with a suspected pituitary source, inferior petrosal sinus sampling, otherwise known as IPSS. As you can probably tell, I spend a lot of my time at doctor's offices and hospitals. I always try to plan ahead and download books, podcasts, and music onto my phone so I have things to do while commuting to and from, and while waiting. I thought I would list a few of my recent favorites so you can give them a try! I find they help the waiting go by faster, and make me feel like it wasn't a waste of time. So, I've changed the name of this blog. I've been thinking about it for a long time, and Life with Cushing's didn't really make sense anymore. I don't have Cushing's at this time, and Life with Chronic Illness is a more accurate phrase to describe my life. Of course, this doesn't change the fact that Cushing's is still a big part of my life, and will continue to be a big part of my blog. As you may have read over the last week or so, I had a PET scan scheduled for yesterday. It didn't go as planned. I had been having insurance issues, and waiting for special approval to change plans even though it was outside of the window to do that this year. I called every day, waited on hold for up to an hour, and on Thursday, the approval came in. Just in time. Well, as usual, that was the end of my luck. Social media dominates most people's lives these days. You see what everyone you know is up to, but the problem is, most people only post about the highlights of their lives. You don't get to see the low points, the every day struggles. You don't see what keeps them up at night with worry. Everyone around me has a seemingly perfect life, they are traveling, getting job promotions, buying homes, dating, getting engaged, married, or having babies. It is hard to scroll through and see all the things I thought I would be doing at this point in my life. Instead, I am applying for disability. I am driving back and forth to doctor's appointments. I am staying away from my grandmother because she is sick, and I can't get sick, not because it's an inconvenience, but because my life could be threatened by the flu. I spend my nights awake worrying about money, or what could jeopardize my health further. I have often said, I wish I had cancer instead. Most people would not understand this sentiment, why in the world would you wish for such a horrible disease? It is another common thread tying people with chronic illness together. If my disease was cancer, everyone would know what it was. I wouldn't be questioned by my boss when I called in sick. My friends and family would be more supportive. My doctors wouldn't question my symptoms. Maybe my life would be easier. But, maybe this would not be true. I am not looking to find out. Chronic illness is lonely. It seems, from the outside, that cancer is not. Most people know someone with cancer. Most people know what cancer involves. Endless appointments, surgeries, maybe even chemotherapy or radiation. Cancer is life threatening. Did you know that a lot of chronic illnesses involve all of the same things? One of my least favorite things about my life with chronic illness is having imaging appointments. Whether it's my yearly brain MRI, or a chest X-ray, the whole process is uncomfortable, and sometimes even painful. Usually, when a physician wants me to have imaging, they will schedule an appointment, usually the soonest available is a week or two out, sometimes more depending on the test. You usually have to arrive at the hospital 15-30 minutes before your scheduled appointment time, on top of that, there is typically a wait. They almost always make you change, even if you follow their instructions on what to wear. I almost always go into these appointments in a sports bra, t-shirt, and leggings or yoga pants with no metal. 9 times out of 10, they still make me change into a hospital gown. I don't know about you, but I would feel much more comfortable in my own clothes. A hospital gown is not the most comfortable, or flattering thing to wear. A lot of people would think blogging about your personal health issues or disease would be too personal, and too revealing. Why would someone want to reveal personal details about themselves online? For me, it is not about giving all the dirty details. It's about raising awareness, providing support to others with chronic illness, so they know they are not alone. It's about the person reading this blog, that thinks they might have Cushing's, who might get help a little sooner than they would have without reading my story. It's for friends and family, so they know what's going on in my life, with my health, without me having to tell the story over and over again. It's been a little while since I gave a real life/health update, so I figured I would include that in this post. Yes, I'm doing it again! I'm going to be blogging for 30 days in April for Cushing's awareness. If you have any posts you want to see, or any ideas to get the word out about Cushing's, let me know. Today, I'm going to be talking about my Cushing's story, which still continues, even 8 years after I was diagnosed. I remember the moment I realized something wasn't right. My mom was taking me to the mall, because none of my jeans fit me anymore. She was talking about how she wished I would try to lose weight, because she has been overweight most of her life, and didn't want that for me. But, I needed pants to wear to school, so I bought another size up. I remember thinking, nothing has changed. I didn't eat more, or less, I hadn't stopped any activities. Maybe this was just my metabolism slowing down. This weekend I will 31. Every year on my birthday, I have the thought, wow, I made it to this age. There was a time where I didn't think I would get to be 31. I know that sounds dramatic, but with Cushing's Disease, multiple major surgeries, you know the rest, I have had multiple times where I didn't think I would, or didn't want to, live through it. My life is far from perfect now. I am not working. I was denied disability again. I wonder what I'm doing with my life, how will I ever make a difference in this world. What is my purpose? Why am I here, still, today? But there are always things that are great. I live for Huck, I live for my family, I live for the hope of a better day, a day without illness. Right now, I'm living for planning a family vacation next summer. Or a trip to MV this summer. Or dinner with friends Saturday night.